The hottest restaurant in Pasadena (and one of the most-talked about restaurants in the country) for the past 18 months has been Union. Securing reservations at this establishment for a number of months seemed harder than securing an audience with the Pope, or in other words, we didn’t have a prayer of getting in. Finally, we have made it to this much-hyped restaurant on a couple of occasions, and after dining here, the verdict is in…the food lives up to (and in many instances exceeds) the hype, making it the winner of the coveted (well, maybe some day it will be coveted) MaiTaiTom Best Restaurant of 2015 Award. 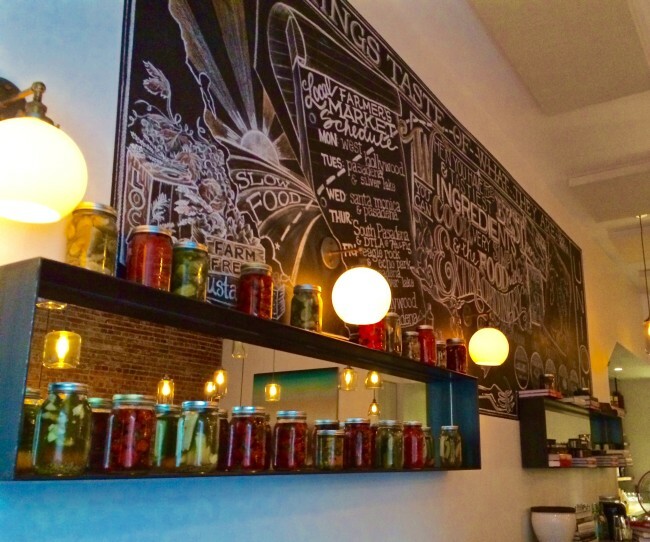 Chef Bruce Kalman is the man behind the great food. The former chef at Churchill and Urbanno Pizza Bar and his business partner Marie Petulla have made this 50-seat establishment THE culinary stop in Pasadena. 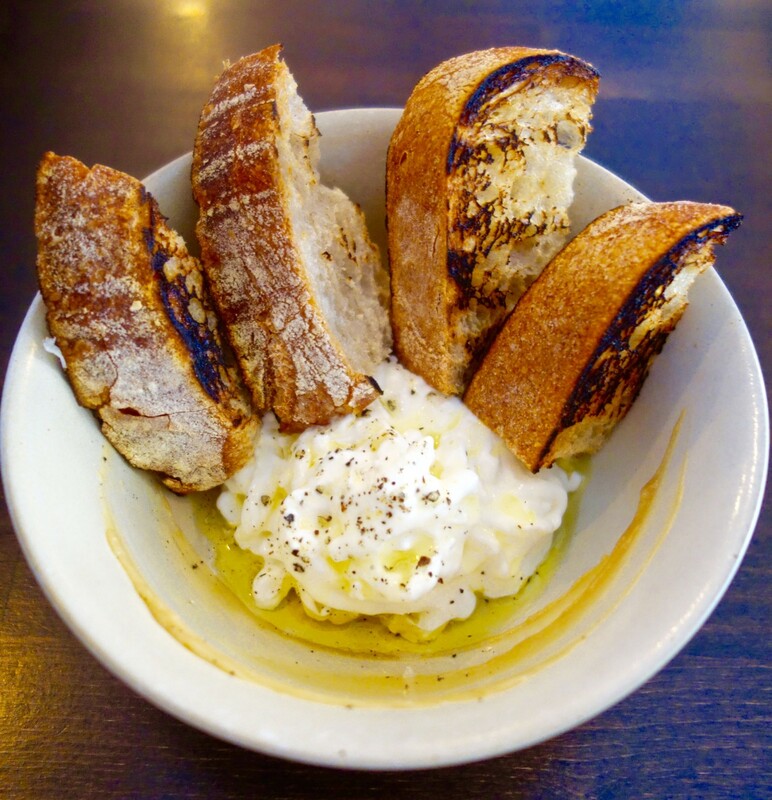 It’s been described as a “California version of Northern Italian cuisine.” That works for me. He also is known as “The Pickle King” because of his Bruce’s Prime Pickle Co., but thankfully pickles were not a part of our dinner, since I am pickle-impaired. Chef Bruce also has the distinction of being on the television show Beat Bobby Flay. How did he do? 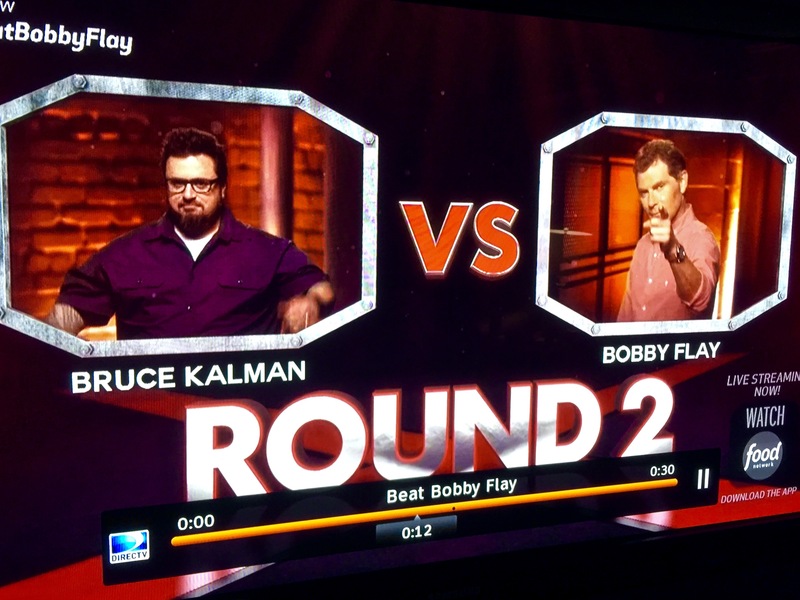 He won (albeit it was the second time he appeared…he lost the first one). Our first venture to Union was with friends Burt and Paula, and we came with a hearty appetite, which was a good thing, because we ate a lot. Union was hot and happening on the Sunday evening of the “Blood Moon” eclipse. We saw the chalkboard or we might have walked on by. Reservations are a must. While we dined, numerous walk-up people were turned away. Union is housed in an airy space with exposed brick walls and seemingly like all restaurants these days, it’s a tad noisy (but thankfully not exceedingly so). There is a small bar for the walk-in crowd (who get here early), and we were quickly seated (yes, we had reserved two weeks before) at a table in the front window space (which sheltered us from the noise). Our excellent waiter (Joey) helped us decide on the menu items, as they recommend the food be shared “family style.” Since Burt doesn’t eat pork (poor guy), we mostly skipped the pork dishes but vowed to return to try them on a future visit. Plus there were some more pasta dishes we yearned for at the table adjacent to ours that were calling our name. 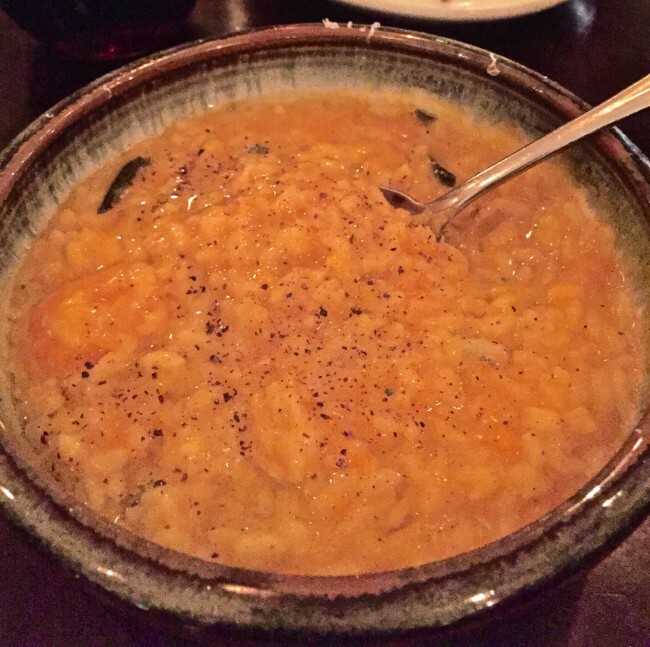 The menu has a few “staples” but otherwise changes often. Everything is made in-house including the meats, pasta and gelato. 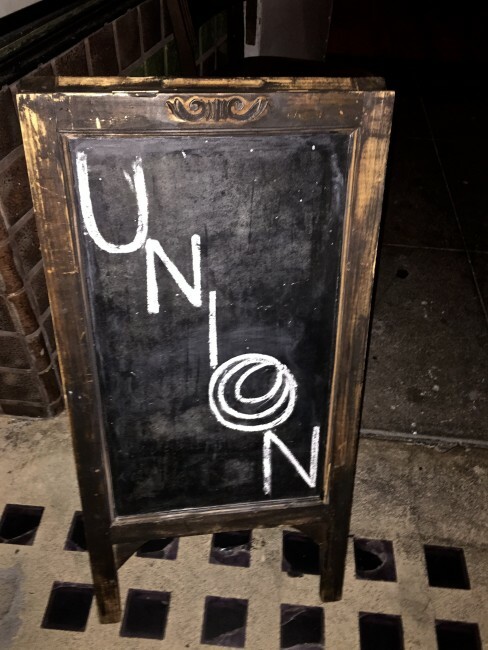 Union is only open for dinner. That’s because during the day they are butchering and cooking. 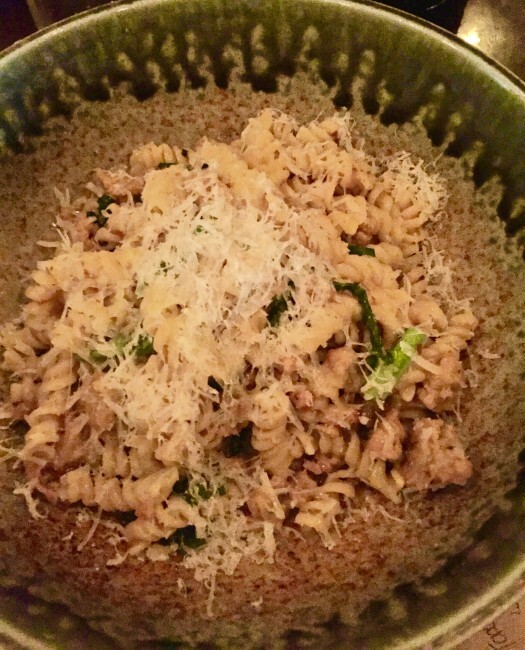 We also learned that Chef Bruce is opening a fresh, hand-made pasta bar and market in downtown LA’s Grand Central Market, Knead & Co. Pasta Bar and Market, in the near future. The corkage fee is $25, but is waived if you purchase a bottle from their wine list, which Joey explained was half Italian and half California wines. He decanted the bottle of wine we had brought and even gave us a taste of the Nebbiolo Langhe (Piemonte 2012), which we ended up ordering with dinner ($52). 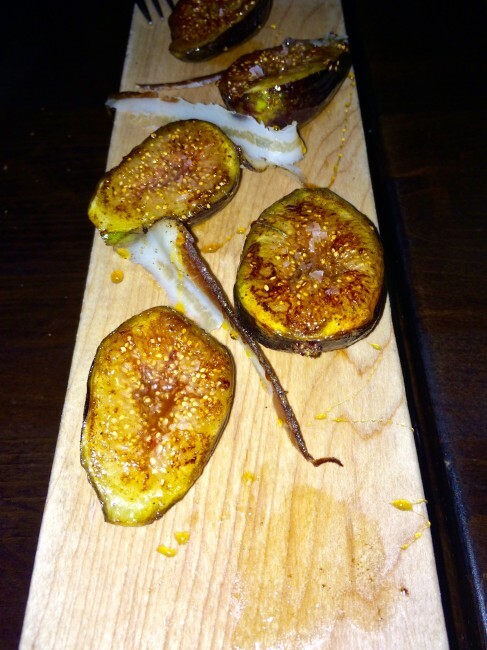 Next up were six grilled Black Mission fig halves drizzled with buckwheat honey (no alfalfa) and pancetta ($17), followed by a shaved fennel salad with arugula, grapefruit, house made ricotta and fennel top sorbet ($16). Both were outstanding. 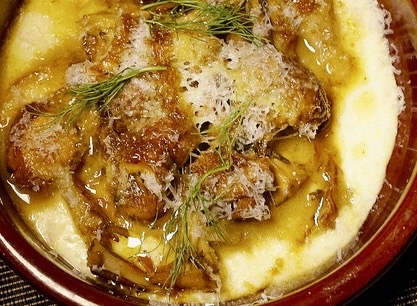 And lastly for the appetizer round; a bowl of wild mushrooms on a bed of polenta with sherry vinegar, sage and rosemary for $15 (photo below courtesy of examiner.com). We were on a culinary roll, which coincidentally was mirroring my stomach. From the “Pasta” section of the menu, we tried the Squid Ink Garganelli ($24) (handmade version of penne) with Maine lobster, fennel, Meyer lemon and truffle butter. This was so stupendous that Tracy told me she will not be sharing this with anyone next time (me neither). 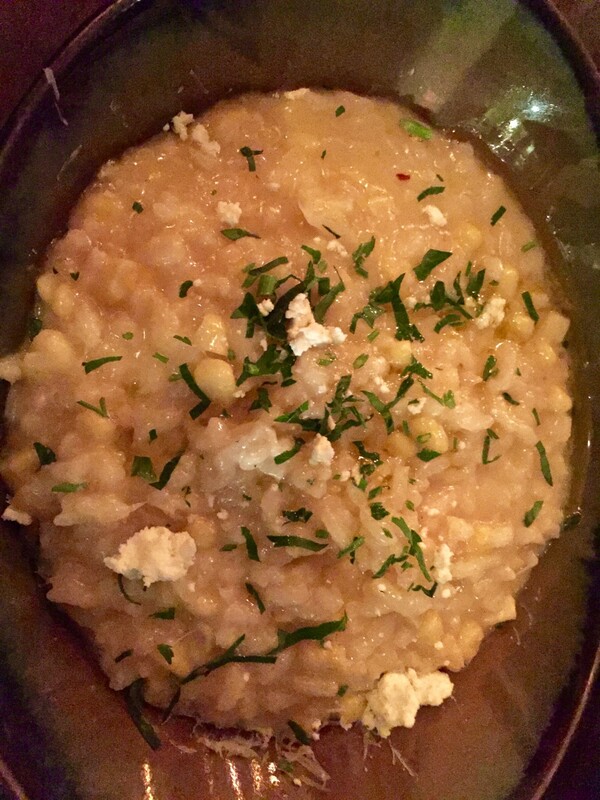 From the “Main” portion, our group opted for the smoked sweet corn risotto with goat cheese ($17) and the Pitman Farms Duck Breast served with collard greens, guanciale and peruano beans ($32). The duck was outstanding, but with six bite-sized pieces I think it could be eaten by one person as a main course. Fresh small plates and utensils are changed out with each course. The small plates are brought to the table in a cigar box (sans cigars). Tracy can’t live without olive oil and fleur de sel, both of which were used to great effect. While it is recommended that everything be shared, other than a few of the appetizers, many of these dishes could easily be eaten by one person. For dessert we shared Union’s “Signature Dessert”…Olive oil cake with salted honeycomb gelato (above). 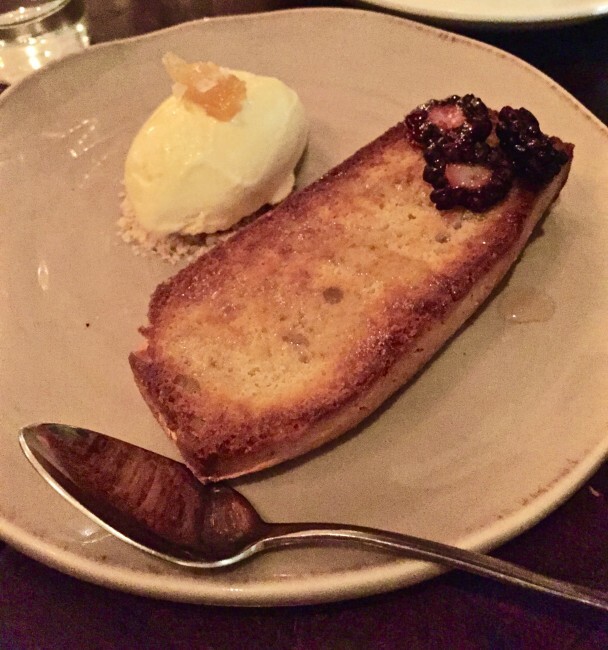 The previous week when I was at a UCLA football game (back when they were still good), someone overheard me talking about our upcoming reservation at Union, and they highly recommended the olive oil cake. It was good, but not nearly as good as the other two desserts we inhaled. We also ordered Gianduja Chocolate Budino (cocoa nib, truffle salt, Ligurian olive oil) and a Bay Leaf Pannacotta with berries, balsamic and basil. 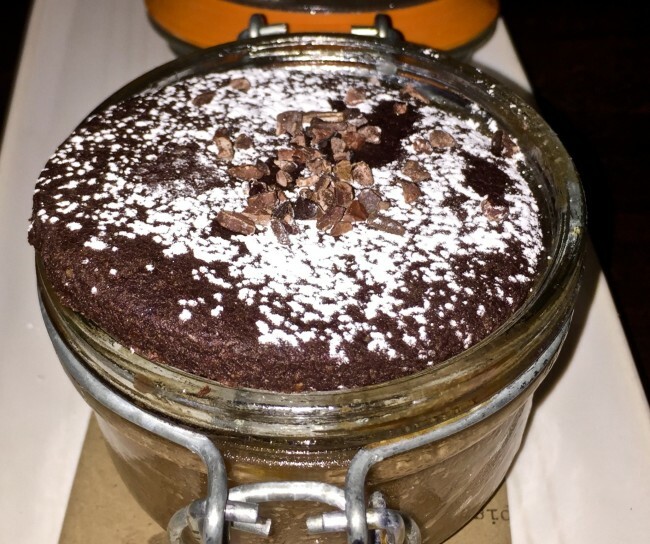 The Gianduja Chocolate Budino (recommended by Joey) was served in a small jar. It was outstanding! Gianduja is a European style of chocolate made from chocolate and nut paste. 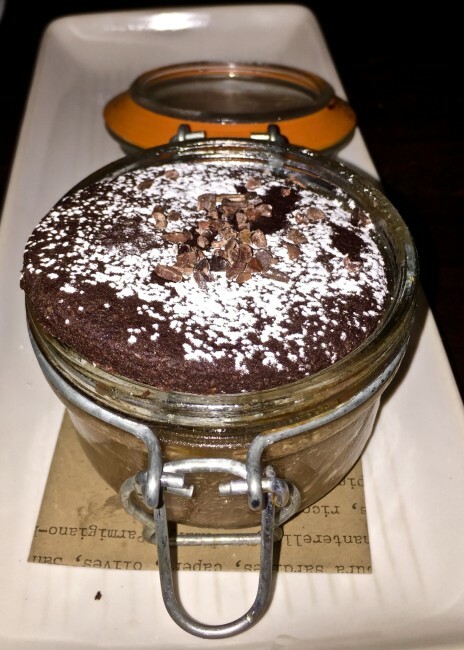 It was a thick chocolate pudding with cocoa nibs topped with a brownie. I believe scrumptious would not be overstating this dessert. 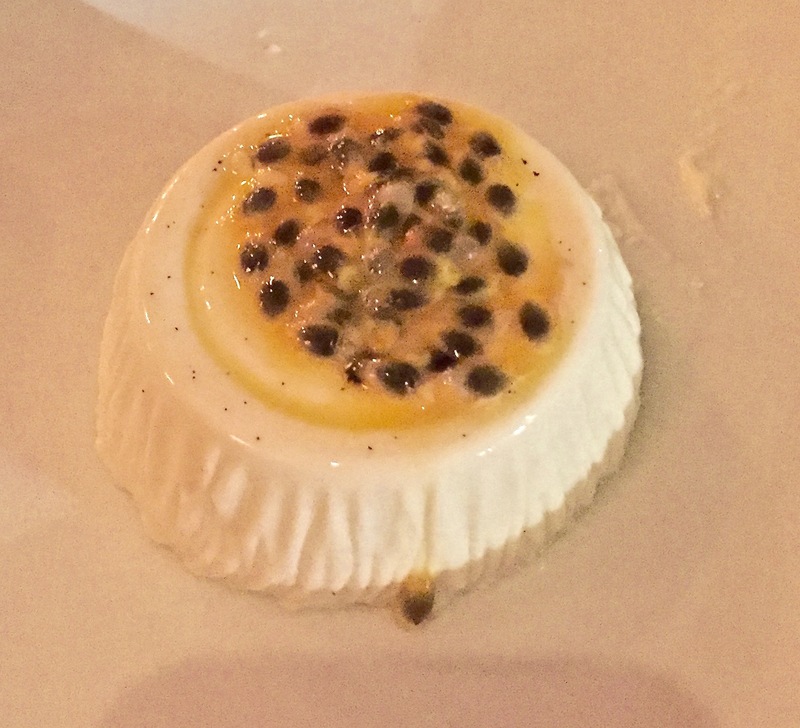 To be honest, we were skeptical of the bay leaf pannacotta, but Joey assured us it was delicious (and he’s never lied to us before). 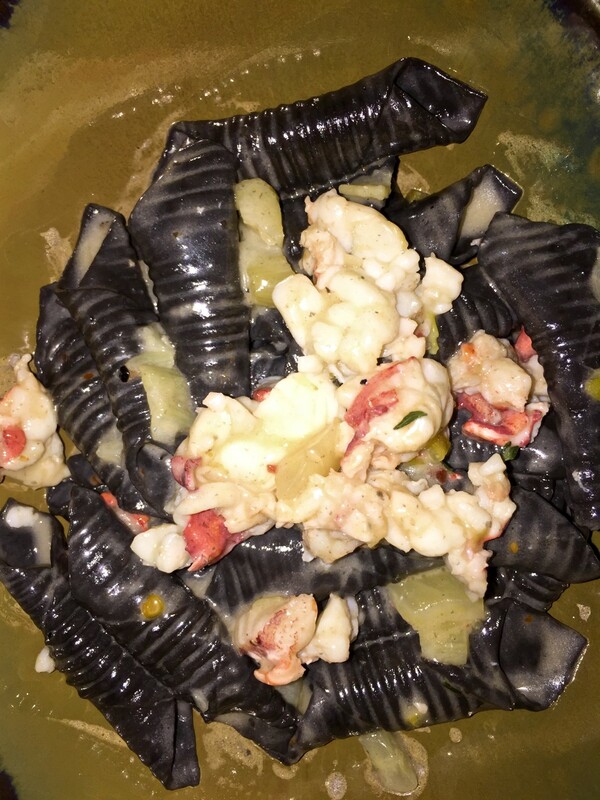 Joey was spot on… the bay leaf flavor worked really well with the berries. Another winning dish. A few weeks later we returned to Union to try some of the items we had not tasted (and a couple of “old” favorites) on our previous trip. This time it was a Wednesday night and, as it was previously, the joint was packed. The menu changes daily, which was great as we could try some new things. 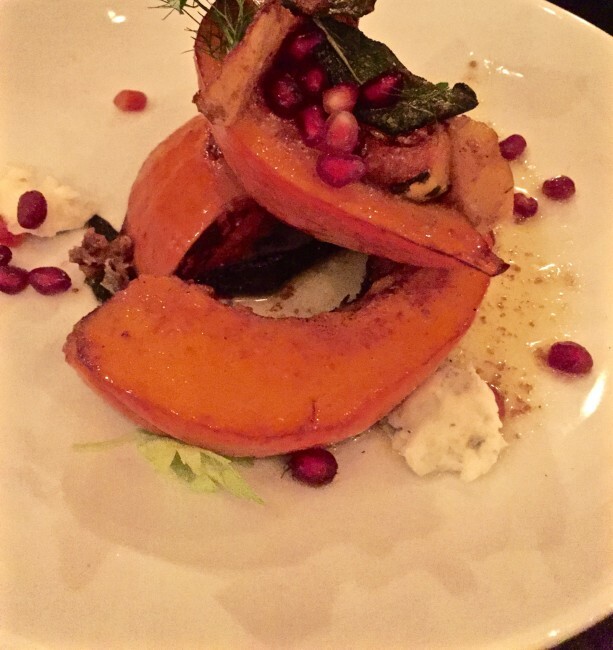 Our friends, Paul and Susan, started with the Sunshine Kabocha Squash ($14; delicate squash, gorgonzola dolce, sage and pomegranate). While Paul greatly enjoyed it, Susan thought it was a tad “gourdy.” I stole a healthy portion of this dish and thought it was wonderful, although I did not tell Susan she was out of her gourd. 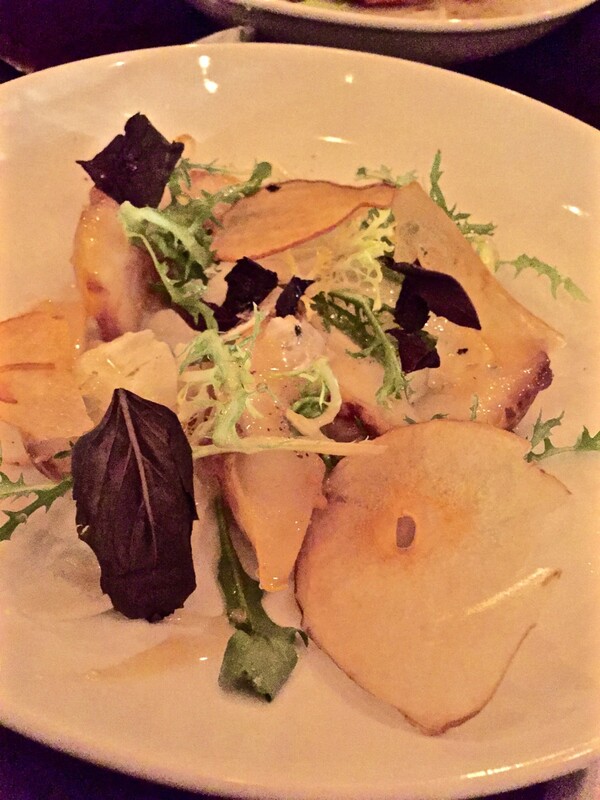 Tracy and I shared the Bartlett Pear Salad with pecorino, frisée, pear mostarda and buckwheat honey ($14). 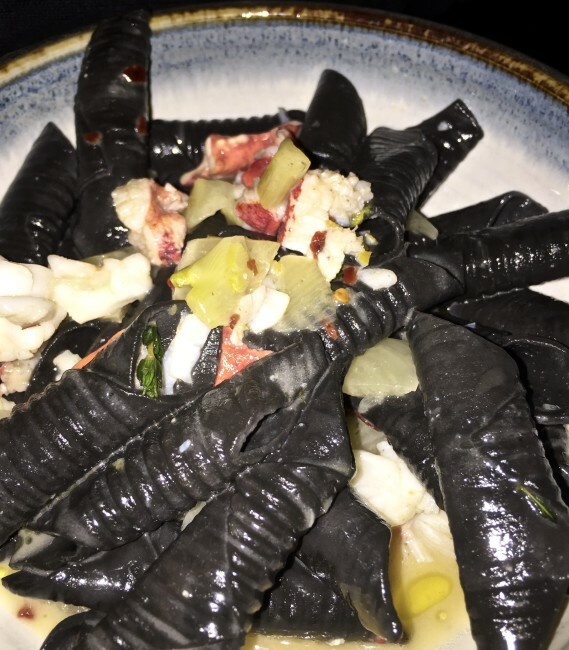 The table shared (yes, Tracy and I shared again) the squid ink garganelli ($24) which just as good as we remembered from our prior trip. 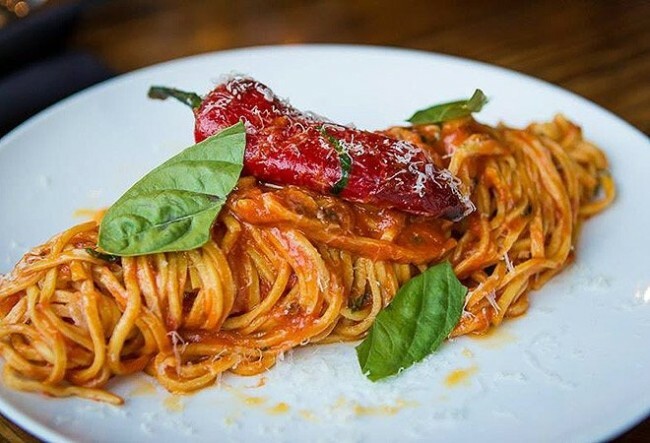 Our totally cool NYC waiter recommended the spaghetti alla chitarra ($17) with San Marzano tomatoes, garlic and fresno chiles (photo below courtesy of Union). Paul took him up on that recommendation and said it was excellent. Susan and Tracy both went for the fusilli with pork fennel sausage, spigarello and pecorino-romano cheese ($18). It was stupendous. The sausage, as well as the pastas, ragus and gelatos, are all made in-house. I tried the risotto alla zucca ($18) with butternut squash, sage and parmigiana-reggiano and didn’t share it with anyone (no one ever accused me of being a giver at the dinner table). There was a cacio e pepe dish on the menu. I don’t usually pass on cacio e pepe, but this one had White Alba truffles added, which boosted the price to $80…just a tad outside our budget. Also on the menu (and a dish we saw come out a few times and will definitely order next time) was the Porchetta with Weiser Farms potatoes and salsa verde ($29). It looked really good, and the waiter informed us it has limited availability because it takes 1 1/2 hours to cook. We’re going to get one of these pork dishes someday. For dessert, Paul and Susan ordered the famous olive oil cake (they loved it) while Tracy and I shared the addictive Gianduja Chocolate Budino. Once again, the desserts shined. Both of our dinners at Union were fantastic, and to win the MaiTaiTom Restaurant of The Year Award this year it had to be damned good. 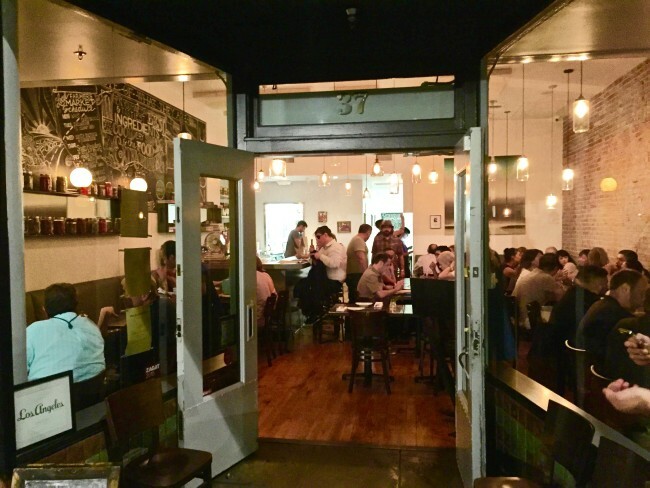 We were fortunate to dine at a number of excellent dining establishments in 2015. Union barely edged out Redbird in downtown Los Angeles and Little Beast in Eagle Rock. 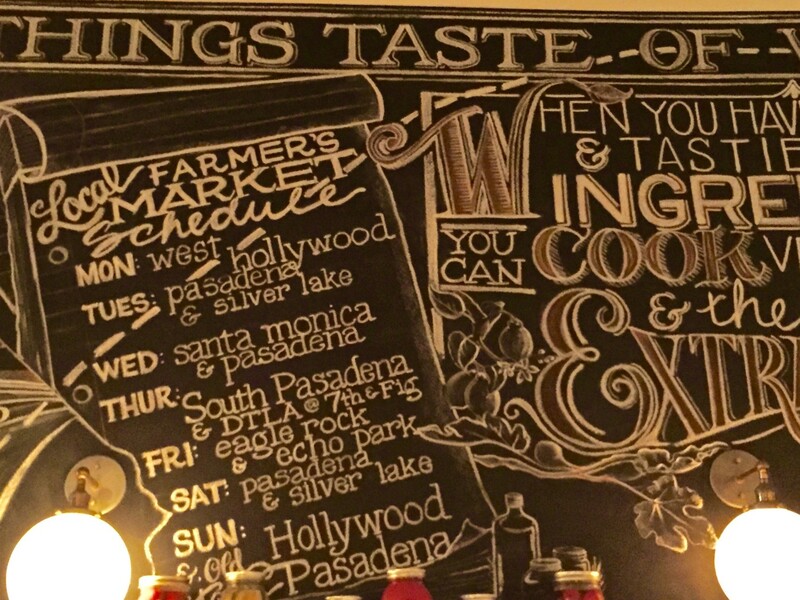 If you live in the Los Angeles area or plan on visiting, I highly recommend dinner at Union…and don’t forget to make reservations well in advance! A more perfect Union has never been formed, especially one that helps so much with my constitution. Hours: Monday – Friday 5 p.m. – 11 p.m. • Saturday/Sunday 4 p.m. – 11 p.m.